You are currently browsing the tag archive for the ‘stormwater management’ tag. The restoration will give a home for these Cormorants. They are sitting at the point on the diagram above. I received some really exciting news about the Cooks River from Mudcrabs. Sydney Water recently spent over $3-million removing more than 6,000 tonnes of silt from the Cooks River & now intends to naturalise over 1km of the riverbank at three sites. They have called for tenders & work is planned to start in early 2013. The three areas of riverbank to be targeted are at Whitten Reserve in Belfield, Flockhart Park to Beamish Street Campsie & the area in front of & adjoining Cup & Saucer Creek Wetland at Canterbury. All planning diagrams for the three sites show the planting of many new trees. 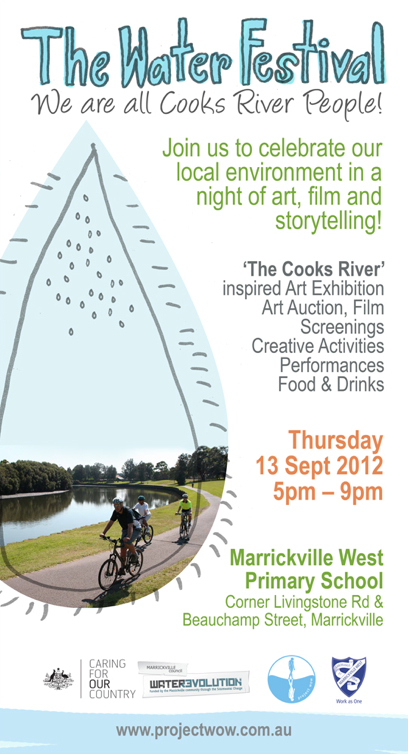 This is a bonanza for the health of the Cooks River, the wildlife & the community. 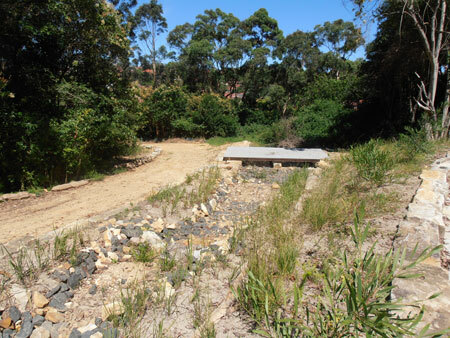 Last year the Cup & Saucer Creek Wetland won the Highly Commended award at the NSW Stormwater Infrastructure Association Annual Awards for Excellence. Sydney Water deserved to win. The wetland cost $900,000 & was money well spent. Cup & Saucer Creek Wetland is a fantastic achievement & is very beautiful. Lucky are the people whose properties back on to or face the wetland. I’d love to be waking up to the sound of the birds in the morning. From being a lawn with a couple of trees, it is now an important habitat area filled with waterbirds & other life, including turtles. On top of this, the wetland cleans the stormwater coming down the Cup & Saucer Creek channel before it enters the Cooks River. The community will benefit from the new works too, as we have already benefited from the environment of the Cup & Saucer Creek Wetland. The habitat around Cup & Saucer Creek Wetland from the pedestrian bridge at the Sugar Factory to Mary McKillop Park will be extended & the lawn removed. This is a good length in an area filled with waterbirds. There will be new viewing platforms, new seating (great because there isn’t much), saltmarsh plants & gravel paths, plus many new trees. 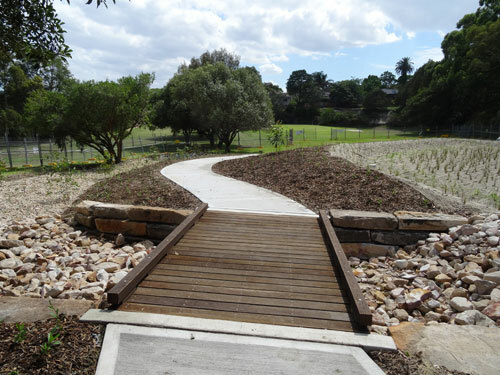 The area from Burwood Road to Beamish Street will also have new trees, saltmarsh plants, a viewing platform & a gravel footpath. 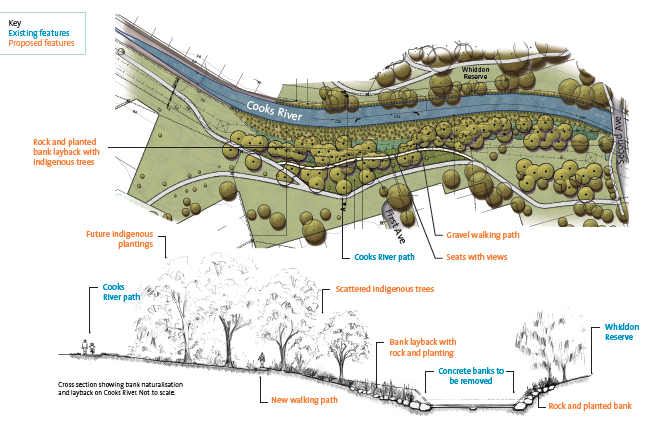 Similar additions are planned for the area at Whiddens Reserve. Slowly this beautiful river will be repaired from the terrible damage inflicted upon it over the last century. The restoration works by Sydney Water will be a better legacy to bestow on future generations & I am quite excited about it. 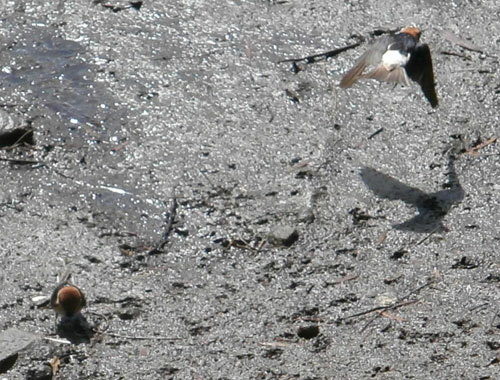 A flock of Fairy Martins are busy building mud nests under the Illawarra Road bridge in Marrickville. 5. Sadly, about 301 million rural trees have died in Texas as a result of the 2011 drought. Estimates are that a further 5.6 million trees will die in urban areas of Texas also as a result of the 2011 drought. http://usat.ly/OSstp0t. There are a number of pretty verge gardens along Newtington Road Stanmore. Raingardens slow water down, spread it out & then soak it into the ground. Hard surfaces speed up rainwater, concentrate it into a smaller area & take it to drains & then to wherever the drains go. In our case, it is mostly the Cooks River. “A rain garden is a beautiful landscape feature you can put in your yard at home to collect rainwater runoff from your rooftop, your downspouts, driveway, any hard surface. And the plants & soil in the rain garden will filter out any pollutants found in that runoff & slow it & divert it before it goes in the storm drains.” They can be big or small. Because of recent research by researchers at the University of NSW, we now know for sure what everyone suspected; that the Cooks River is a hotbed of pollutants. Interesting that fishing is increasing along the river when it would be dubious any fish caught is safe to eat. Unfortunately, most of the pollutants (oil, metals, pharmaceuticals, pesticides & other contaminants) come from stormwater that flows directly into the river. Stormwater even as far away as Newtown is in the Cooks River catchment area. 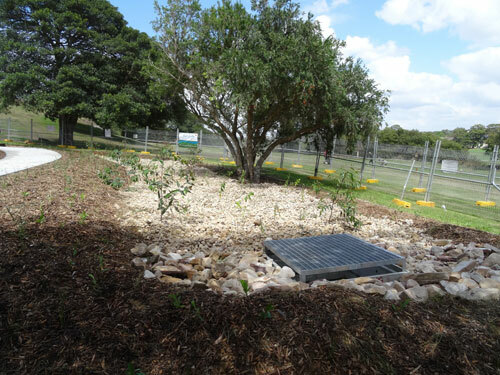 Marrickville Council designed & are in the process of implementing quite detailed stormwater management across the municipality to reduce pollutants entering the Cooks River. 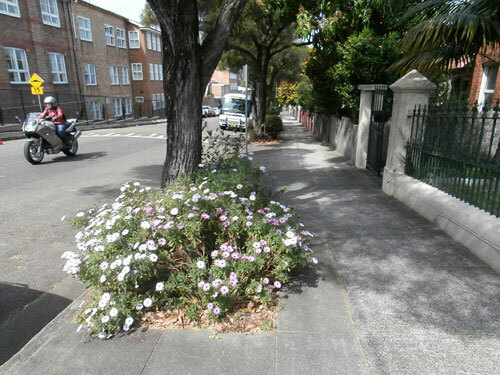 Some accessible examples are the swales in Steel Park & at Thornlie Street Marrickville South & raingardens in Wallace & Hill Streets, also in Marrickville South. I have just learnt of a community driven effort in Seattle to curb pollution from stormwater runoff into Puget Sound. Residents plan to build 12,000 rain gardens over the next 5-years to prevent approximately 160 million gallons of stormwater pollutants entering Puget Sound each year. It is estimated that 40,000 metric tons of oil & grease enter Puget Sound every year & that 75% of all the toxins found in the Sound comes from stormwater runoff. Therefore, 12,000 raingardens should have a significant & positive impact on the water quality of Puget Sound & this benefits everyone, including the environment. 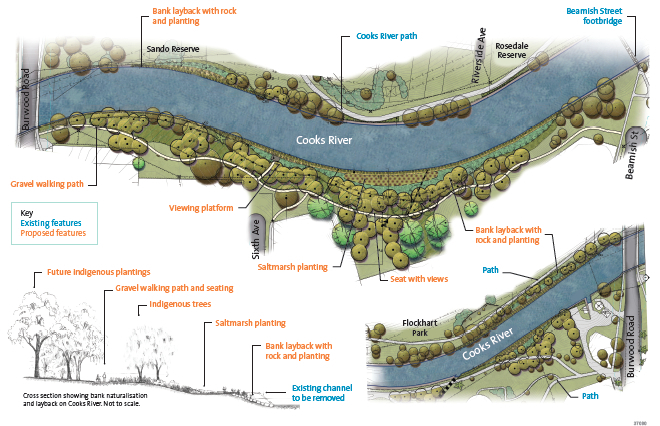 I think it would be quite easy to set up a similar program in Marrickville LGA, as well as the other Council areas that surround the Cooks River. If we started in our neighbourhood first, perhaps the other communities would be inspired & do the same. I think most people care about the health of the river. The great thing about raingardens is that once you build them, they essentially look after themselves. 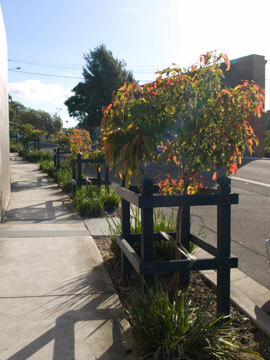 Raingardens can also help street trees by diverting stormwater into the ground rather than down the drain. 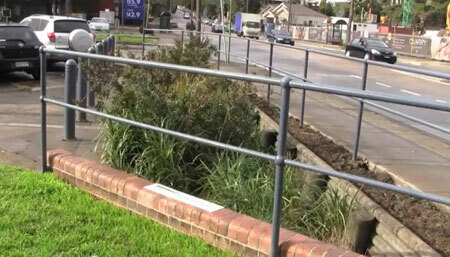 The following are short videos of swales & raingardens built in Marrickville South. They are all quite different from each other & all enhance the landscape. They probably look even nicer as the plants would have grown more since these videos were taken. This is one type of raingarden. 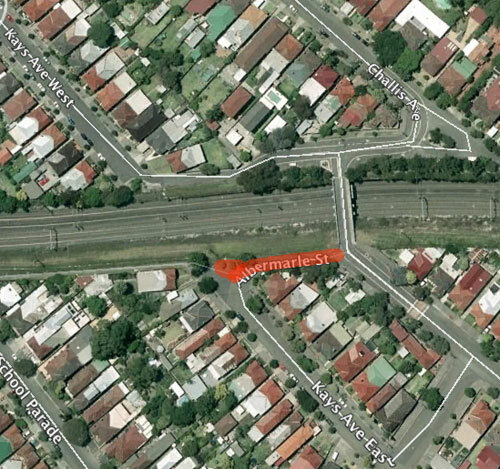 It is at the bottom of Hill Street Marrickville South & was built by Marrickville Council. Raingardens can be made to look like an ordinary garden with flowers & small shrubs & be of any size. I saw this clever idea in Marrickville recently. 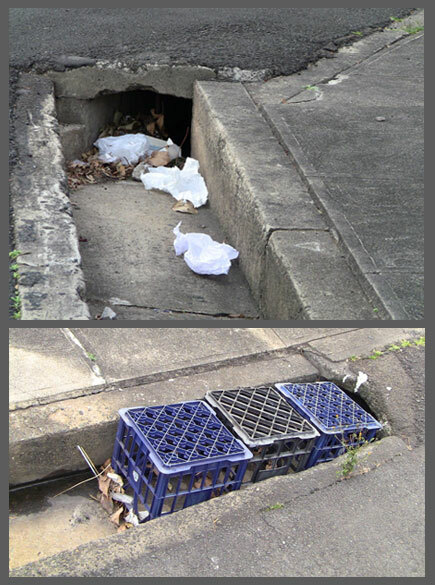 These milk crates prevent the under-road pipe from becoming blocked with rubbish & leaf litter. This photo is of both sides of the same street. 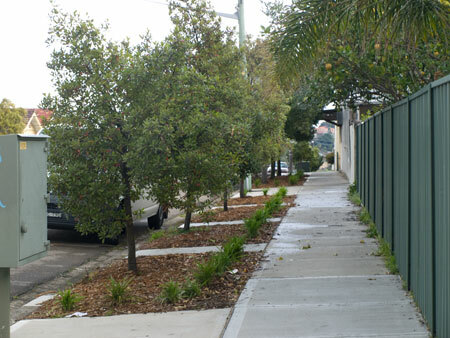 Marrickville Council has recently replaced the concrete footpath & created verge gardens along Mansion Street Marrickville South. I think they look terrific & greatly improve the streetscape. The street trees now have an opportunity to collect sufficient water when it rains & the gardens themselves should reduce stormwater runoff. There are no problems for pedestrians as there are wide pathways from the roadside to the footpath placed at regular intervals. 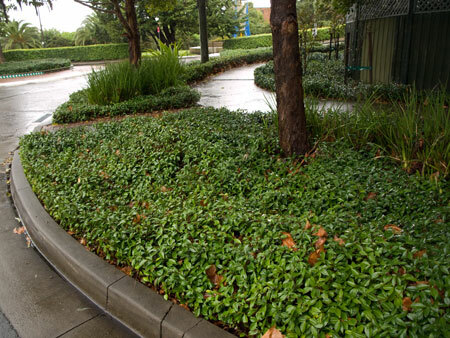 Considering that Marrickville Council spends in excess of $2-million every year just on mowing grass verges, I think verge gardens like this would be a far better use of our rates. Imagine what $2-million could do each year if it were put into planting street trees & landscaping our streets & parks. It wouldn’t take too long to significantly green up our landscape. Research has shown that the greener the environment is, the happier & healthier people tend to be. Verge gardens are also beneficial for the environment. They help collect stormwater & pollution from passing traffic & if planted with wildlife-friendly plants, could also provide a food source for our urban wildlife. We know a good-looking street tree increases the property value of those near it, so it’s only logical that verge gardens & a better-looking streetscape would also improve property values. Green really does equal money when it comes to real estate, especially in high-density areas like the Inner West. 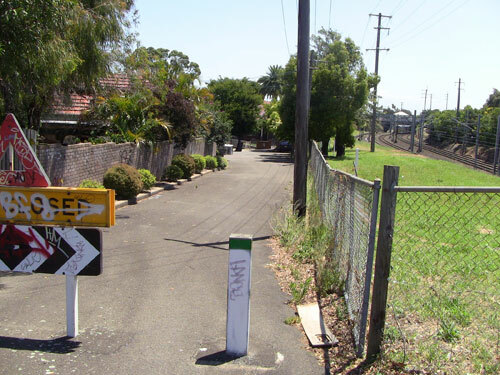 Of course there are streets in Marrickville LGA that do not have room for verge gardens or where they would be impractical, but many could have them. If verge gardens are put into the right places, they should not impede pedestrians or people leaving vehicles. The size of the verge gardens I have seen across Marrickville LGA mean that people pushing prams or shopping trolleys can do so without difficulty. On the newish verge gardens in Livingstone Road Marrickville, Council has put a concrete path from the kerb to footpath opposite the front gate of all the houses facilitating unobstructed movement from car to house. This has been repeated in all the other verge gardens I have seen. Where multiple verge gardens have been created along a street, there is a pedestrian pathway to the footpath every few metres big enough for a wheelchair, pram or trolley. Council also don’t put plants on the kerb-side of the garden so that people don’t have to exit the passenger-side of the car into shrubbery that could cut their legs or cause them to fall. My experience of Marrickville Council is that they are highly vigilant when it comes to safety so I can’t imagine them putting in a verge garden where it would cause people problems. If Council were not spending all their time mowing grass verges, they could be managing the verge gardens instead. Apparently, once they are grown, verge gardens look after themselves & only need a bit of occasional weeding. There is always room for other plants so if property owners wanted to add other plants, they could. They just need to be safe plants for passing pedestrians, children & dogs – so no cacti or other plants that could cause injury, nothing that could cause difficulty for passengers leaving cars & no high-growing plants that could reduce visibility for drivers. I know this is a contentious issue in the community. I’ve heard arguments against verge gardens that residents should not have to look after the verges, therefore grass verges must continue. My personal opinion is that verge gardens have much in the way of benefit & there is no reason why Council cannot continue to look after these areas. Some people say they like grass verges & I appreciate that. I don’t dislike grass, but I much prefer plants & flowers. The reality is the climate is changing & as a society, we must make changes that will help lower the urban heat island effect or we will be condemning ourselves to be living in an oven. Grass verges are less effective at cooling through evaporation than plants & trees. 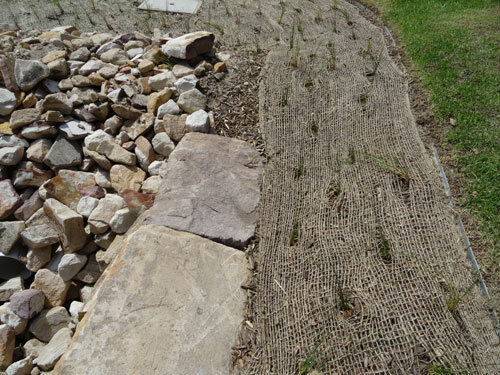 A dried out grass verge can take on the qualities of hard surfaces, not absorbing rainwater well. Grass requires a lot of water & maintenance to keep looking good & does nothing to help with biodiversity. could see as I drove along Sydney Park Road in St Peters – a lot of trees near the road, the old brickworks buildings & an enormous grass hill that I didn’t feel like climbing. Then I read an article in the Inner West Courier in 2009 about the killing of a black swan by a dog. Black swan……in Sydney? This enormously sad news item & the subsequent letters from the community was the prompt I needed to finally visit. That first visit in 2010 is something I will not forget. We stood at the bottom of the park at the Harber Street entrance & surveyed an enormous park with multiple lakes, masses of normal-shaped large trees, patches of woodland & birds everywhere. We were hooked. How had this wonderful place been unknown to us for so many years? If you haven’t been, you must go at least once. I doubt it will be your last visit. Okay there are hills, but most are easily walked. Many people run up them. Wide bitumen footpaths meander through the park. If a hill seems too much for today you can easily head in another direction. The bulk of the park is wheelchair accessible though better if you have someone who can help you up those hills if needed. Prams are a cinch. There is an ‘all-abilities’ playground, accessible toilets & a kiosk, though I haven’t seen these yet. 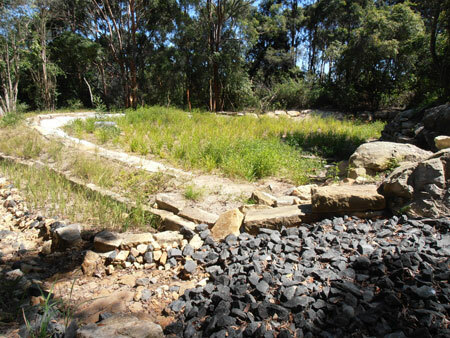 The 44-hectares of Sydney Park is less than 20-years-old & was built on a former clay extraction & waste disposal site. It is a prime example of how industrial & landfill land can be turned into something beautiful. It was created by the City of Sydney Council who continue to manage it. They not only have created something that is beautiful & entirely useful for the current population, but everything they are doing is creating something for our children’s children & beyond. I don’t know how many Fig trees the City of Sydney Council have planted, but I’d guess at least 200 trees. I’ll have to find out. The Figs are planted reasonably close to each other to create a continuous canopy when grown & to provide shade. They are all young, but in 2-3 decades time, these Fig trees are going to provide phenomenal beauty. Just imagine how lovely this park will look in 100-years time. Sydney Park has tree precincts. 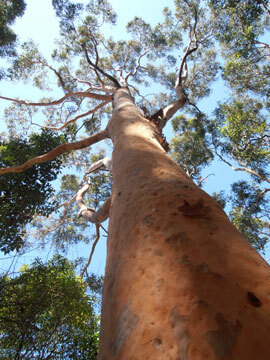 There is the Palm area, the Grevillea woodland, the Tea tree & Callistemon woodland, the Eucalypt woodland, the Casuarinas woodland, the Acacia woodland & so on. We have not seen all the park as yet so there is bound to be more woodland areas. 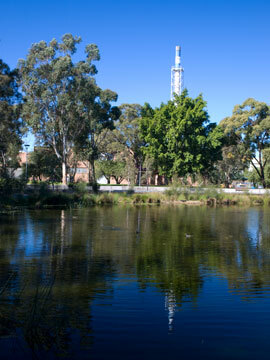 Trees within the park are used to great effect to screen neighbouring factories & surrounding roads. There is no philosophy of maintaining sightlines into this park. 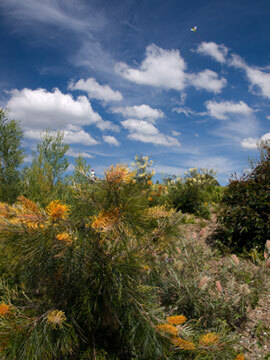 Sydney Park is an oasis & provides refuge from busy city living. As much as possible, the noise of busy Princes Highway & surrounding main roads has been kept out, both visually & audibly. 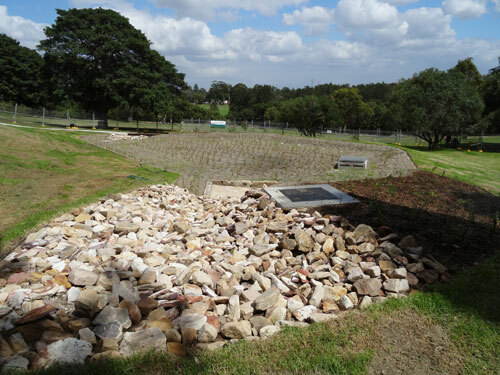 Not only is it a place of beauty, but Sydney Park also functions as a stormwater collection & filtration site. Stormwater from surrounding suburbs comes to a large holding pool where it is filtered & sent on to the first of 5 fairly large lakes. From there it is filtered into the next lake & so on, until it finally filters through the ground into the watertable. The lakes provide 5-star habitat for a wide range of water birds, including migrating birds & Spoonbills. There are birds everywhere in Sydney Park & they are both wary & curious of people which means you can have a good look at them, but not touch. 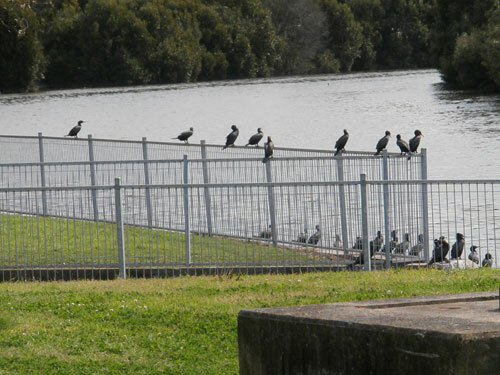 City of Sydney Council has almost completed fencing the lakes to prevent another dog attack. Wooden poles attached to the cyclone fencing have made the fences look beautiful & a part of the landscape as well as being functional. 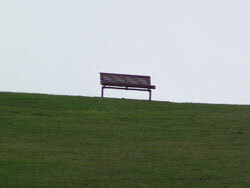 This is just one example of how artistic, but functional design has been used in Sydney Park. Nothing here is ordinary in my opinion. Everything has been done with beauty in mind & to provide food & habitat to urban wildlife. There are a number of swales that take stormwater from the park itself into the lakes. We last visited while it was raining & it was easy to see the design that had been implemented to capture runoff down the hills. Much had been directed into woodland & garden areas & the remainder channeled to meet up with bio-swales that took the water to the lakes. To prevent soil erosion, great long snakes of coir encased in rope were laid around garden beds or in front of vulnerable trees. Some of the pathways are permeable. 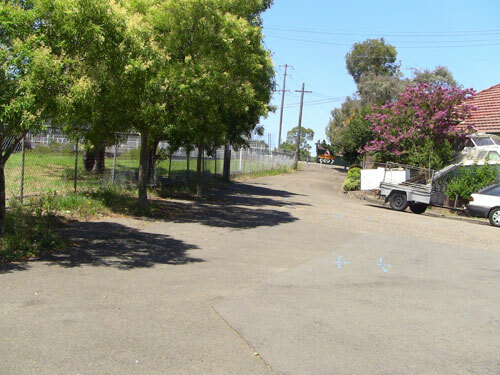 While there are areas of lawn for informal ball games, City of Sydney Council have not created yet another park that is essentially paths & lawn surrounded by trees around the periphery & a few along pathways. They have recognized that people want & need shade & desire areas to sit where they can be in the shade. There is not a Crepe myrtle to be seen. They have planted a range of bird-attracting trees & shrubs making this park useful to urban wildlife & there are many areas where it is difficult for people to enter allowing wildlife to have safe habitat. 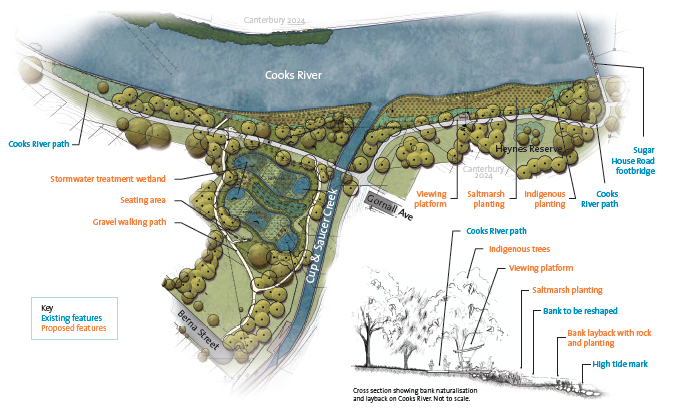 Much of what has been done in Sydney Park could also be done along the Cooks River. If it were, it’s likely that a greater range of water birds would live along the river. 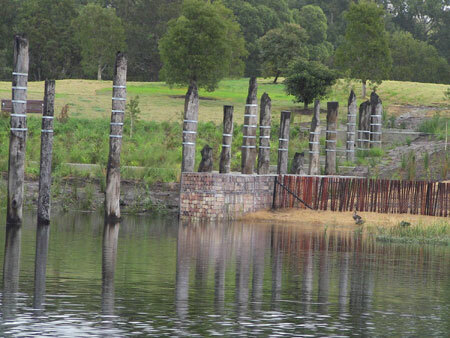 Poles have even been sunk upright into one of the lakes to allow birds to perch as well as making an artistic statement for humans. Trees have side branches offering other places to perch. Few plants are ornamental only. 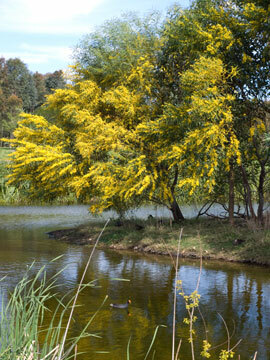 While there are grasses around the lakes, grasses are not the main feature of any planting. Even groundcover is of the type that produces food for small birds. There is loads of colour from flowering trees & shrubs & this will change seasonally. The ground is healthy as there were a range of gorgeous mushrooms & toadstools growing after the rain. I am in love with Sydney Park. It would have been expensive for City of Sydney Council to create, but this is money well spent & the park is going to only get better as it matures. There are other features, such as a memorial woodland, that I will post about later. 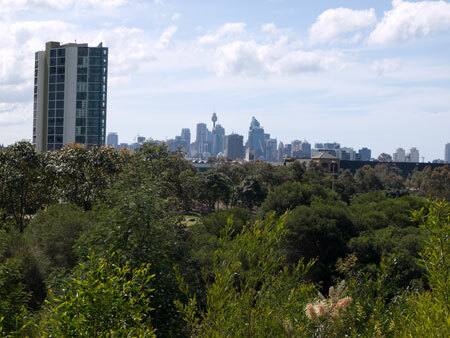 Sydney Park is a prototype of a people-friendly, dog-friendly, wildlife-friendly green space that is not ordinary in any sense & that will only improve as the decades pass. City of Sydney Council have probably won awards for Sydney Park. If they haven’t as yet, then they should. They deserve it.